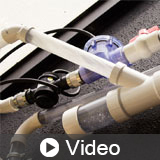 Explain how vacuum plumbing systems work (key components for an efficient operation). Compare and contrast vacuum plumbing vs. gravity plumbing (sustainability, health and safety, cost, design and construction flexibility). Discuss the environmental benefits of vacuum plumbing. Explain application for vacuum plumbing as related to LEED certification. Discuss infection prevention with vacuum plumbing.